“This is going to be a unique project, in the sense that for the first time in Africa, UP will have an accredited national reference laboratory, accredited in terms of meeting international standards, and the reference laboratory to reference for testing purposes for industry at large. Our alumni and other engineers in the industry will benefit a lot from this project,” said Prof Sunil Maharaj, Dean of Engineering, Built Environment and Information Technology at UP. The future transportation hub will be housed in the new Engineering 4.0 facility on the Hillcrest campus, on the doorstep of the N1/N4 Proefplaas Interchange. 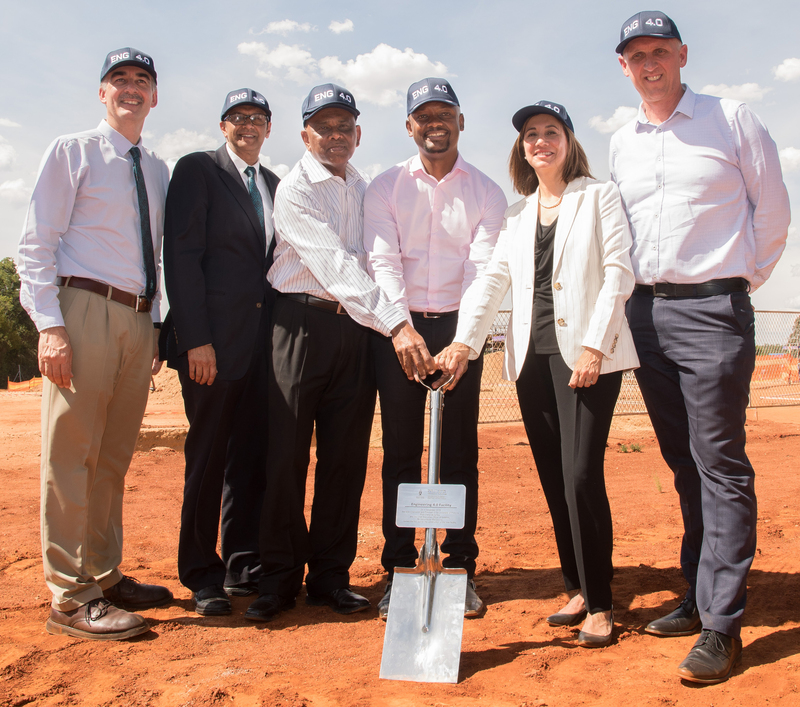 The sod-turning ceremony took place on 4 December 2018, and the completion of the facility is planned for November 2019. This facility will consist of the accredited SANRAL National Roads Materials Reference Laboratory, training laboratory, an Accelerated Pavement Testing facility, an active traffic track for real traffic testing, and an upgraded concrete research laboratory. The facility also provides future expansion of the laboratory, and experimental and testing facilities related to interdisciplinary and transdisciplinary research. The vision is to have a research hub where industry, academia, government and research students across the world can develop future innovation to make South Africa and Africa a smart country and continent. “This three-way partnership demonstrates the ability to align individual priorities to create a bigger impact jointly. While the university stands to gain futuristic engineering and research facilities, the CSIR stands to benefit from the body of research that will be pursued at UP and gain valuable postgraduate research skills, and SANRAL and the rest of the road sector stands to benefit from the material testing, quality assurance and research output for road application purposes. The space planning and designs that have been produced for this facility promise a vibrant interactive and state-of-the-art facility that will hold its own among the best in the world, while exposing both students and the industry to cutting-edge research, training and material testing,” noted Skhumbuzo Macozoma, CEO of SANRAL. “The significance of this project is that this is truly a partnership. We have UP, CSIR and SANRAL working together and being responsible for the roads in our country. Three institutions will come together to discuss prioritises and specifically how each—with our own distinctive mandates—can pull our expertise and our resources to make an impact that will shape the future of transportation in South Africa, and beyond our borders in Southern Africa,” said Prof Cheryl de la Rey, Vice chancellor and Principal of UP. In the long run the facility is expected to provide, among other things, top-of-the-range laboratories to provide a platform for quality training, reference testing and research in transportation engineering; a unified effort to train engineers, technologists, technicians and materials testers for the skills needed in future transport engineering—as well as postgraduate research output; and a pipeline of transport engineers that have been exposed to the latest technologies and methods. The objective of this agreement is to consolidate resources to ensure maximum cooperation between the parties, in order to create a critical mass in laboratory facilities and skilled human resources to address challenges—including the lack of highly skilled personnel throughout the transport sector—efficiency, and avoiding the further erosion of the current remaining skills. With the Fourth Industrial Revolution upon us, and the importance of smart infrastructure and big data science in driving job creation and economic growth, South Africa needs to prepare its graduates for the future world of work. This Future Transportation Hub and Smart Cities Hub is the vehicle that UP is using, in partnership with SANRAL and others, to take South Africa and Africa into this new, exciting and, at times, ambiguous future. “The importance of this project agreement is that South Africa is currently facing a shortage of engineers—as well as transport engineers—and a shortage of quality controls systems when building our roads. SANRAL, CSIR and UP decided that if we have a national reference laboratory for people building roads, that means they will have a third-party independent laboratory where materials can be tested. For our postgraduates needing space, facilities and equipment, this facility will offer them an opportunity of working in a world-class facility. We are also delighted that the Minister of Transport Blade Nzimande is looking forward to this project,” concluded Prof Wynand Steyn, HOD of Civil Engineering at UP.